Schmidt opts for continuity in Ryan-Toner second row partnership for Scotland. Ringrose will partner Bundee Aki in the Ireland midfield for the first time. PERHAPS IRELAND’S LONG-TERM second row pairing of James Ryan and Iain Henderson is not as set in stone as first imagined, or else it’s the case that Joe Schmidt is offering loyal servant Devin Toner one last chance to restake his claim. Schmidt has decided against returning to the locking partnership he started the Six Nations with by leaving the fit-again Henderson on the bench, instead opting to maintain continuity with the Ryan-Toner combo for Scotland. Henderson suffered a hamstring injury during the round two win over Italy and sat out the following week’s defeat of Wales, a game Schmidt said he could have played in but it would have been a risk. There is no risk this week with the head coach declaring the Ulster and Lions second row fully fit again despite his involvement being limited to a place among Ireland’s replacements. Remember, too, Toner has been one of Schmidt’s loyal servants, albeit before last March when he was dropped for England. The 31-year-old will win his 57th cap on Saturday, 43 of them coming as starts under the Kiwi. “I think the three of them have done really well for us in the championship so far,” Schmidt said. There is also the logic that Henderson has the ability to make a much greater impact off the bench as the game progresses. Schmidt continued: “Over the last couple of weeks, Iain possibly could have played against Wales but it would have been a risk. There is absolutely no risk of him re-injuring himself how. “It’s just a case of trying to add some balance, it also adds a bit to our last 20 or 30 minutes of the game. Guys like Andrew Porter who has done very well for us starting, Jack McGrath had a cracking first 50 minutes against Italy. 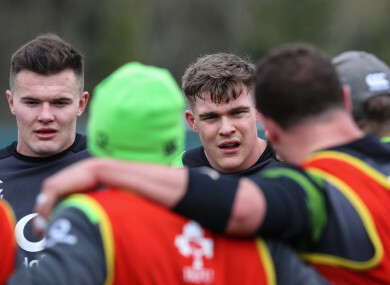 While the head coach will be hoping for big contributions from the likes of Porter, Sean Cronin, Henderson and Jordi Murphy at various stages, a lot rides on the returning Garry Ringrose getting through Test match intensity again. Having started nine consecutive games in a green shirt last season, the 23-year-old makes his first appearance for Ireland since June against Scotland having played just six games of rugby this season for Leinster. Schmidt admits his selection after so little game time is a result of a ‘needs-must’ situation because of the injuries to Robbie Henshaw and Chris Farrell, but he has absolute confidence in the 11-time capped international. “Yeah of course it is [a concern], especially when Robbie Henshaw is world-class and Chris Farrell slotted in so well last time,” Schmidt admitted. “It’s a needs-must situation, but it’s a situation where we’ve got a lot of trust and faith in Garry. “There’s always concerns about players for different reasons. Garry’s only had six games in this entire season. “That’s something you calculate in but sometimes you don’t have the luxury of a plethora of options. He’s been extraordinary when he has played for us, he’s done a great. Rob Kearney, who will win his 82nd cap from fullback on Saturday, echoed those sentiments and said there are no concerns among the playing group about Ringrose slotting back in alongside Bundee Aki. “He’s been really good, as Joe said he was extraordinary when he played last year,” Kearney said of his Leinster team-mate. “He’s a smart guy, he’s trained really well this week. It’s important for him but it’s important for the players around him as well, that he’s brought a huge amount of confidence for himself, but also for us too. On the challenge posed by Gregor Townsend’s Scotland this week, Kearney admitted there are some nerves over the threat the visitors carry, which is certainly powerful enough to derail Ireland’s Grand Slam bid. “We’re really excited to get out on the field and get going again,” he said. “There’s nerves and a little worry about the threat Scotland bring. “We’ve reviewed quite a bit of what happened over there last year, and the manner of those first 20 minutes, the damage they did to us. Email “No fears over Ringrose and Henderson as Ireland look for big impact off the bench ”. Feedback on “No fears over Ringrose and Henderson as Ireland look for big impact off the bench ”.